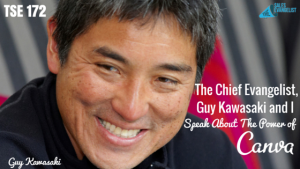 Home » TSE Podcast Post Page » TSE 172: The Chief Evangelist Guy Kawasaki and I Speak About The Power of Canva! What more can you do to up your sales without spending money? Obviously, social media is one of the quickest and most strategic ways to get to your clients. But are you actually doing it right? Do your social media posts or even emails create enough attention to break through all the noise in the marketplace? In today’s episode, Guy Kawasaki, the chief evangelist of Canva talks about how entrepreneurs and sales persons can best utilize Canva. Guy was initially a user of Canva for his social media accounts and it wasn’t long until Canva co-founders Melanie and Cliff noticed it and approached him. So, Guy decided to get involved. Guy is also the author of numerous books including his recent ones The Art of the Start 2.0 and The Art of Social Media. Canva enables people to make great graphics for their social media posts or emails in just a matter of minutes. Genius! Boost your social media engagement by making great graphics and beautiful designs like a pro through Canva! Be it jazzing up your profile, social media posts, email graphics, thank you cards, etc. Melanie was teaching graphics at the University of Western Australia and noticed how hard it was for students to learn Photoshop and Illustrator. Break through the noise by adding graphics to your social media posts and emails. Graphics on social media posts get 2-3 times the attention than does pure text. Other great stuff you can use Canva for is making Thank You cards you can send out to your clients. You don’t need to be a Photoshop expert to do it. You can make images faster than you do on a Photoshop. Anyone can create beautiful designs with Canva. You don’t have to pay a graphics designer to do the images for you – saves both time and money. With Canva, you don’t need to spend anything! The most you can spend, if you really have to, is $1-2. Use Canva for your social media posts to build up brand awareness. You can also use Canva to create great email headers for direct marketing emails. Doing everything in a parallel way. Dealing with so many things all at the same time.